Asiatropicalfish.com : we are exporter live tropical aquarium fish from Thailand . We export all kind of freshwater fish that from breeding farm and catch from wide river in South East Asia. we had experience in export fish more than 15 years and we really know technique and method to handle and carry fish delivery to our customers all country in worldwide markets. 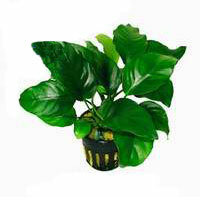 Description : Characteristics: Low growing, creeping plant. Height: 8 - 12 cm. Growth rate: 8 - 1- leaves a year. Propagation: Side shoots from the rhizome. Special note: Will also grow well tied onto rocks or bogwood.